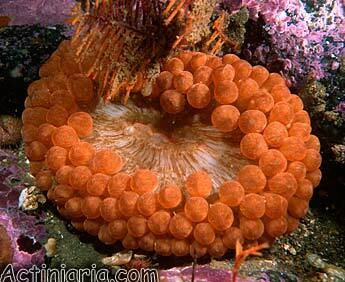 This beautiful and distinctive species has been described only in 2006. It is rather common in NW Pacific, but its distribution appears to be wider. 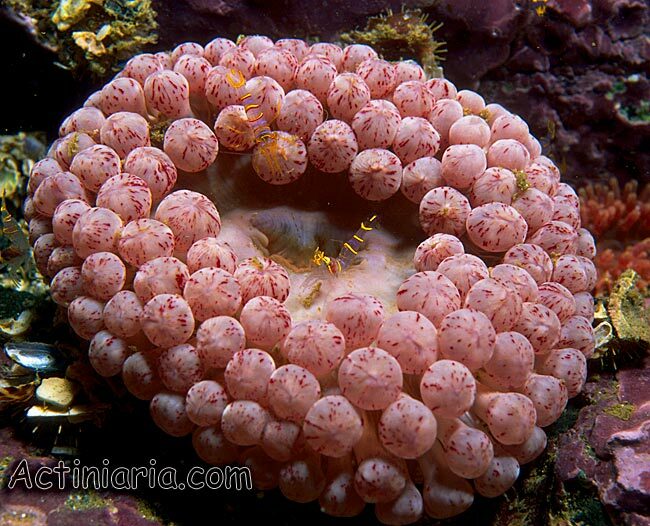 In particular, recently it has been found in the White Sea (N Europe) and also we have photo certainly showing this species taken at 100m off California (scroll down this page to see). 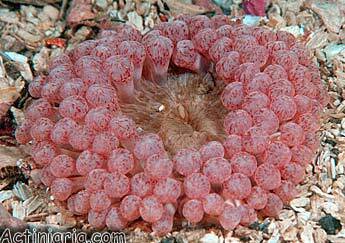 The shape of the tentacles is the most conspicuous distinguishing character for Cribrinopsis olegi: they are short and thick, usually with a large, almost spherical expansion on the end. 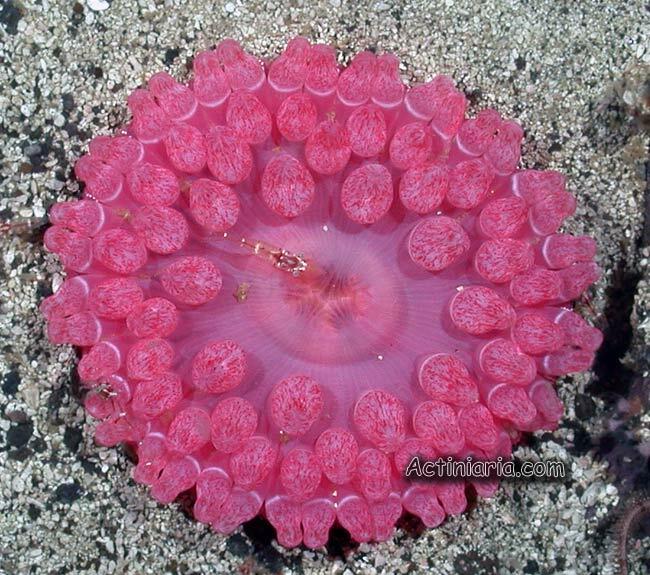 The ground colour of the tentacles is white or yellowish with numerous short longitudinal red stripes on the expanded distal half. The border between the expanded distal and cylindrical proximal half of each tentacle is marked by a wide white transverse band. 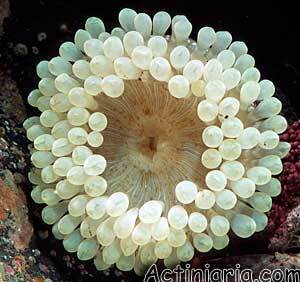 In white specimens the tentacles and oral disk are pure white, without the colour stripes. Cribrinopsis olegi reaches 10 cm in diameter and height. 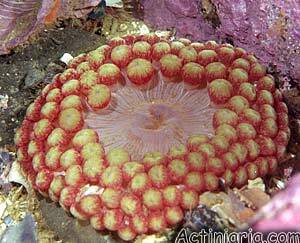 In most specimens the column is rose-coloured or red, with white spots of the verrucae. Some specimens are entirely white. The adhesive verrucae are arranged in longitudinal rows and carry particles of gravel and broken shell. Toward the base they gradually become smaller, less adhesive and disappear completely in the proximal half of the column. The oral disk is always paler than the column, pale rose or yellowish, greyish, whitish, sometimes with irregular light dirty-green patches. The species always is buried in sand, gravel or broken shell with the pedal disk always attached to buried stones so only the oral disk with the tentacles is visible on the surface. Contracted specimens are buried completely in sand. Symbiotic shrimps Lebbeus grandimanus are often associated with this species. Cribrinopsis albopunctata is a related species from North Pacific. SANAMYAN N.P., SANAMYAN K.E., 2006. 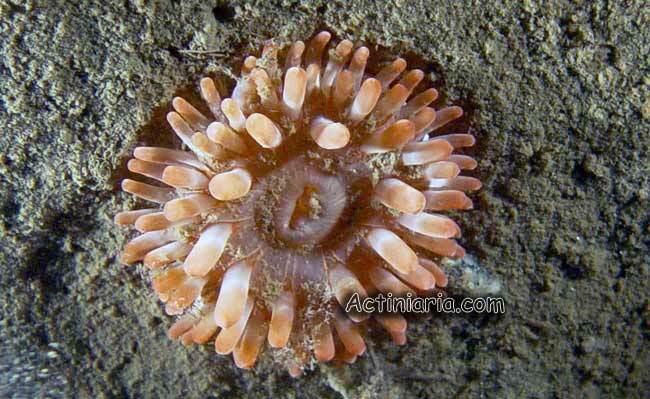 The genera Urticina and Cribrinopsis (Anthozoa: Actiniaria) from the North-Western Pacific. Journal of Natural History, 40(7-8): 359-393.